I think it was when I spotted these pretty little pots of glow on another blog that I did what a typical beauty junkie did – looked up the stockists, found they were sold in an obscure little pharmacy near by boyfriends work and then proceed to try and persuade him to go and get them for me. I obviously need to work on my persuasion skills, as he didn’t go for me and then my short lived attention span moved onto something else. Then the PR for Miners got in touch and I instantly remembered them (and to be honest, couldn’t recall knowing much else about the brand) so she sent them over for me test out. Sun Kissed on the right, Sun Blushed on the left. The two shades are Sun Kissed and Sun Blushed. Sun Blushed is more pink toned, Sun Kissed more orange/bronze. 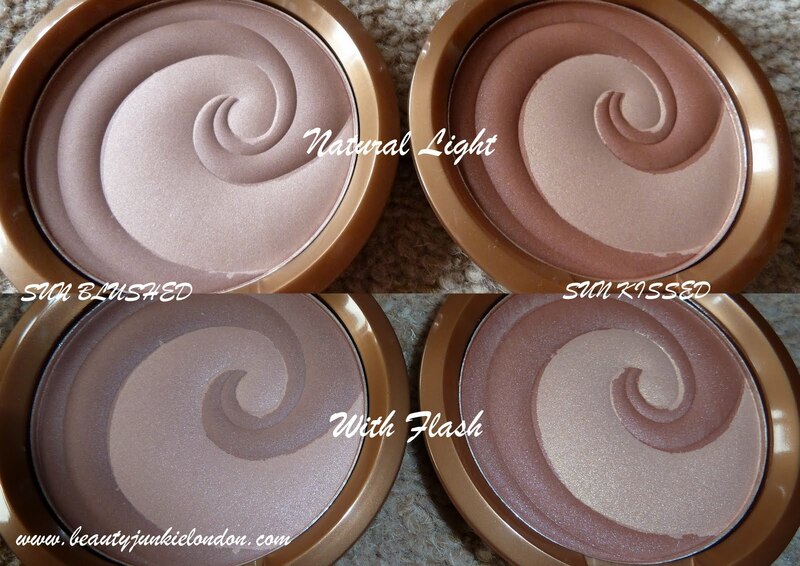 The bronzer is a swirl of darker and lighter product – the lighter shade has a bit more shimmer but both colours have a hint of shine. If you have a smaller brush you could swipe just one of them at a time, or with a larger brush, swirl them together and use as a blend of colour and highlight. I was impressed with the consistency of the powders – for a product that costs only £3.99 they were impressively smooth. There are a few larger chunks of glitter in the highlighter part though. But nothing too severe. The powders aren’t that pigmented – I don’t think this is a problem, although if you have darker skin than me then you want more pigment/colour. For a sheer wash of warm colour these are lovely. L-R: Paler shade, darker shade, blended. So below are the swatches (left to right the lighter colour, darker colour, then blended). My favourite is Sun Blushed, I think it delivers a healthy summer glow that suits my colouring. 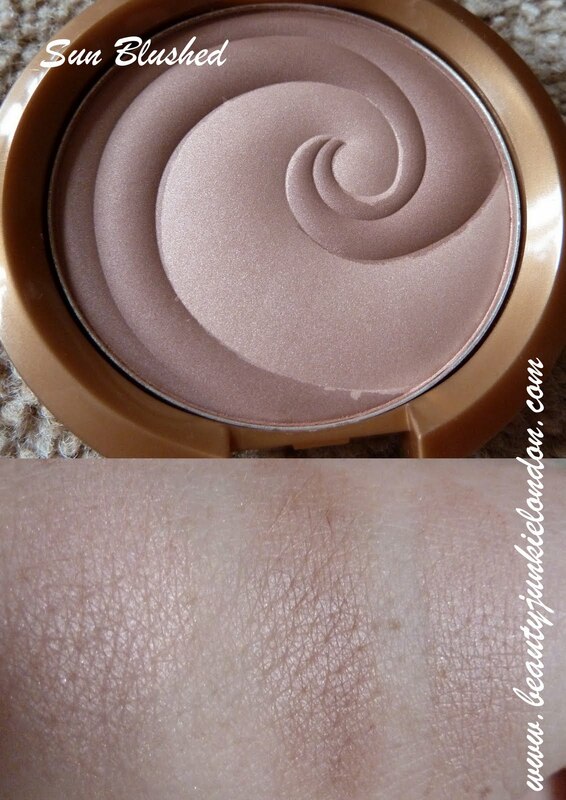 Sun Kissed is a bit too orange for me – but I reckon would look good on olive or generally more tanned skin. Overall view – really nice product for £3.99 and I would happily have bought Sun Blushed with my own money, had I been able to find it. You can order online, but as it’s a brand I hadn’t tried I didn’t want to risk it. You can find out more about Miners website HERE. I remember Miners being sold in “Bow Bangles” in our town centre in the 90s… which is now “Claire’s Accessories”. Old times! My sunblushed is looking a lot less pretty now that it’s had some serious use! It’s a shame as looks lovely with the swirl…! I’ve never tried anything from Miners before but this product looks really cute… and what great value!